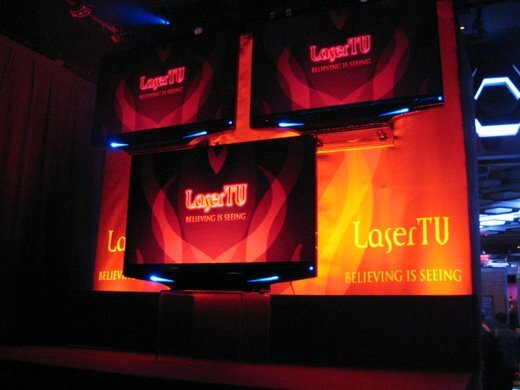 Those mad scientists at Mitsubishi have built the ultimate entertainment weapon—the laser TV! Lasers shooting out of a television screen isn’t as scary as it may sound. But it does have one big benefit-color. Lasers can be tuned to the exact wavelength of light you like—down to the nanometer. So TV makers can produce the ideal shades of red, green, and blue to produce the best colors possibly. 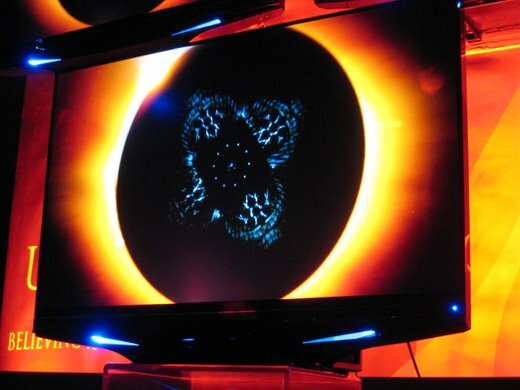 Mitsubishi claims this allows them to reproduce about 80 percent of all the colors humans can see—versus about 40 percent for other TVs. Is all that true? I can’t say for sure, but I know that colors were stunning. And maybe I just had too many cocktails at the launch party, but I think I saw colors that I hadn’t seen before on a TV. 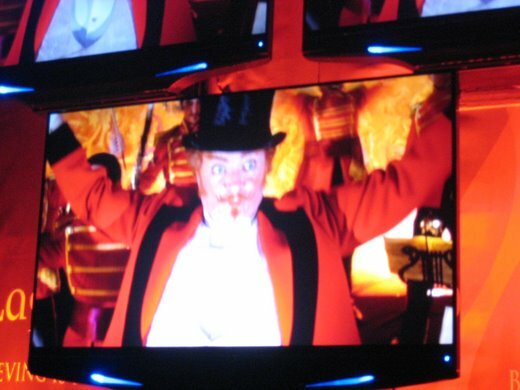 In a clip from Moulin Rouge, for example, the yellows in the dancer’s dresses and in their makeup were virtually luminescent. Same for the falling yellow leaves in the great girl-on-girl battle from Hero. In Star Wars’ final encounter between Anakin and Obi Wan, the light sabers glowed a fluorescent blue that I don’t think I saw in the theater. And then there’s the reds. Mitsubishi was tight-lipped about every single technical detail of the TV, but I’m pretty sure they are proudest of the reds. Almost every scene they showed on the set was saturated in crimson—be it the lava planet from Star Wars, the all-red sequence from Hero or the rouge in Moulin. And that’s significant, because red has generally been the hardest color for TVs to produce properly. The biggest mystery is how Mitsubishi produced such laser-sharp images without the speckly artifacts that are supposed to be inherent to laser projection. Did they put some special foo in the screen to kill the speckle? Are they doing something unique with the lenses. We’ll have to wait to find out. But in most respects, the TV is probably the same as any other Mitsubishi rear-projection TV. Instead of using a projector bulb or LEDs, it uses lasers to light the Texan Instruments DLP chip that reflects images out to the screen. neat. I was just telling a friend how someone should invent a laser-based projector. Obviously they were way ahead of me on this one. As a former Mitsubishi dealer, now retired, I wouldn't buy 3 Diamond tuna let alone any other Mitsubishi product. They are the worst company I ever dealt with in terms of service and dealer/customer support. The only reason dealers put up with it is their limited distribution policy which allows them to make greater margins on Mitsu products. ...Sounds like SOMEONE got wished "luck with all your future endeavours". Been holding out on an HDTV ever since I first heard about laser, in Jan 07. Now, cautiously allowing myself to get excited again. One Mitsu rep said "Available early summer", another source said "Black Friday"...we'll see. Still waiting for mass-market GLV tech. I just brought a LCD with led blacklight and 120hz. can't we all just get along. nope. your friend just made a killing off your idea with his kickass lightning fast R&D team. you lose. > they were way ahead of me on this one. for a 40 something, just smaller than the 52"
I had just bought for about double. Now it sounds like they want to run the price to capture the gold while they have the chance. Do not burn your eye with laser brightness. Laser projector may be a better idea. not for at home use. I agree with Campbell's post, (January 14, 2008). I have to agree with him on this one. There are lots of owners of the Mitsubishi DLP televisions that paid anywhere from $3000 to $6000 dollars for these televisions. Alot of people were lucky if their Mitsubishi DLP televisions lasted 3-4 years and some a shorter time period than that. People have attempted to get help from Mitsubishi for these poorly engineered televisions with no or very little help from Mitsubishi. I bought a first generation Mitsubishi Diamond (the top of the line DLP Mitsubishi televison)in January 2005. The television went out in August 2008. I would highly advise people not to buy this technology until it is tested since it is the first generation laser product out on the market. If you buy it and have problems with it, good luck, you are almost on your own with Mitsubishi which is not very promising in the support and repair category. If you are going to buy this television, you better buy an extended warranty (even though I hate extended warranties) because you will probably need it. It will lessen the pain of not having one and from the high repair bill you will get socked with of $740. I never got an extended warranty on my Mitsubishi DLP television. At least the warranty company will help you get the television repaired. Good luck to anyone that buys any of Mitsubishi's products. Three and a half years on a $5700 dollar television is unsatisfactory. The repair shop even recommended not to get the television repaired when they came out to give me an estimate because they said it would not be worth the cost and it would break again very soon. Just thought I would tell you my experience with Mitsubishi. I got a 65813 mitsubishi diamond 65 inch crt rear projection unit. These units are known to have design flaws, which mitsubishi ignores. Google it- you'll see dozens of do it yourself types soldering new capacitors in a circuit board on the TV to fix their $4000 bricks that are nary 3 years old. Tread carefully into these new laser waters with this company. Make sure you have one heck of an extended warranty! An extended warranty is basically a contract between a car owner and the warranty company. You agree to make monthly, quarterly, or yearly payments, and they agree to cover any break downs or mechanical failures on your car. With most companies there is a deductible, and you will be responsible for this amount in the event of your car needing repair work. Crap cars Awesome American made lazervue tv !! genuine and will I get what I pay for? this TV is indeed goood for our eyes. very useful post. It helped me anyway. I Hope you will continue to make similar post in future. I love your post. LCD has come in trend. I have bought my new 26" LCD last month. Sound quality of LCD is very good. I am happy with my decision of buying it.